Benjamin Franklin had a background and upbringing probably more humble than that of any other notable revolutionary. He was born in Boston in 1706, the son of a man who boiled down tallow (animal fat) to make soap and candles. Franklin’s family understood the value of an extensive education but lacked the money to provide him with one (understandably, given that young Benjamin was the fifteenth of 17 children). At age 12 Franklin’s older brother, a printer, offered him an apprenticeship. They parted ways three years later after Benjamin duped his brother into publishing a series of pithy letters about colonial life; the letters were purportedly written by ‘Mrs Silence Dogood’, but were, in fact, a fiction created by young Benjamin. He travelled to England and worked briefly in London, before returning to Philadelphia. By his early 20s, Franklin was publishing a newspaper, the Philadelphia Gazette. 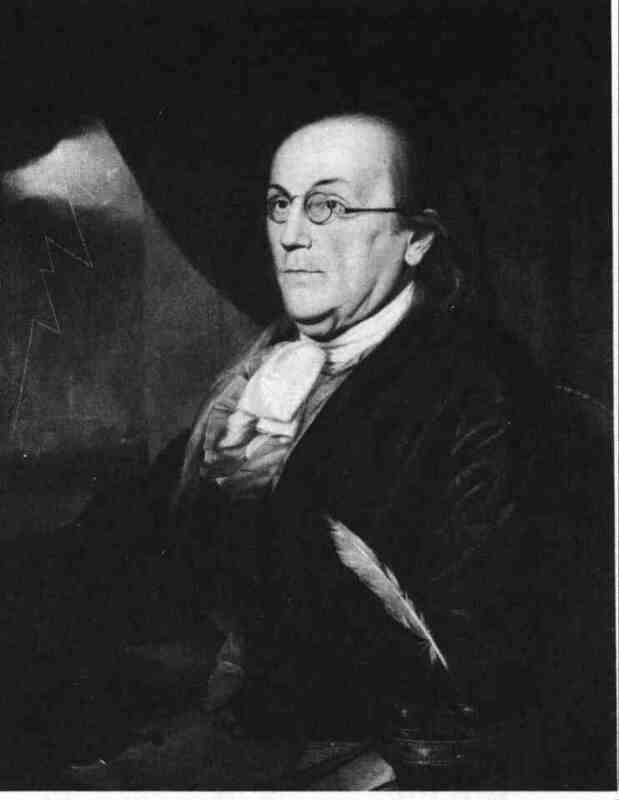 His intelligent and optimistic writings about colonial life, politics, economics and technological advances earned Franklin admiration around his adopted hometown of Philadelphia. By the time he reached 40, Franklin was wealthy enough to enter semi-retirement and become an Enlightenment-age gentleman, devoted to travel and study. He was inherently curious about many things: physics, biology, meteorology, astronomy, oceanography, music, literature, politics and philosophy. Franklin was a prolific inventor, dreaming up gadgets as diverse as the lightning rod, bifocal spectacles, the urinary catheter and a fireplace to produce more radiant heat. He was best-known for his investigations into electricity, particularly his 1752 formulation of an experiment involving kite-flying in an electrical storm. News of these theories spread to Europe and its intelligentsia, and by the late 1750s, Benjamin Franklin was the most famous American in the world. His almanacks and homespun philosophy, with its pithy observations about society and human nature, were popular in America and Britain. Franklin began making regular trips across the Atlantic to England, where he immersed himself in the scientific, cultural and political life of London. He joined Whig political groups, mixed with eminent scientists and writers, and obtained membership of the prestigious Royal Society. In 1762 he was given an honorary doctorate by Oxford University. Franklin, who had received only two years of formal schooling as a boy, relished this honour, referring to himself thereafter as ‘Doctor Franklin’. Franklin at this stage of his life, and indeed until the early 1770s, was no revolutionary – in fact, he was a self-professed Anglophile who loved the vibrancy, hustle and intellectual richness of London. He was in no way inclined to think that America should separate from England. But Franklin was a political as well as a scientific visionary. He was especially concerned about the lack of unity among the colonies, in the face of growing aggression from the French. In May 1754 Franklin created and published one of the most famous cartoons of the revolutionary era, Join or Die, which depicted the American colonies as a dismembered snake. The following month (June 1754) Franklin represented Pennsylvania at the Albany Congress, a meeting of delegates from seven colonies to discuss matters of trade and defences against French and Native Americans. This was the first occasion that a majority of the thirteen American colonies had met to collaborate on matters of common interest – and Franklin leapt on the opportunity. Though it was not on the Congress’ original agenda, Franklin proposed a plan to unite the colonies as a single political entity. Under his so-called Albany Plan, British America would be governed by a president-general (appointed by the king) and a grand council (selected by colonial legislatures). Franklin’s proposal was passed at Albany but ultimately rejected by both London and colonial governments, both of whom were suspicious about surrendering their power to a newly-created government. For most of the 1760s, Franklin was resident in England, where he acted as an agent for Pennsylvanian interests while furthering his intellectual and social pursuits. Acting on instructions from home, Franklin protested the Stamp Act as it was being discussed and debated in early 1765. After the act was passed Franklin, ever the realist, invested in stocks of stamp paper, then lobbied to have a friend appointed as the main stamp agent in Philadelphia. News of this caused a sensation back in Pennsylvania, where Franklin was accused of duplicity and branded a traitor. He redeemed himself by appearing before the British Parliament in 1766 and testifying against the Stamp Act, an action that contributed to its repeal. Franklin remained a loyalist – but parliament’s continued revenue measures, as well as a visit to impoverished Ireland, saw him become more critical of British policies and imperial management. In 1773 Franklin penned an open letter, Rules by Which a Great Empire may be Reduced to a Small One, containing a series of stinging criticisms of British interference in America. 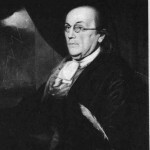 Like other moderates Franklin did not approve of the destruction of privately-owned tea in Boston in late 1773, though nor did he support the Tea Act. The final nail in Franklin’s love affair with Britain was a scandal involving some of Massachusetts governor Thomas Hutchinson’s private mail, in which he argued for the gradual withdrawal of self-government and political liberties in the colonies. Franklin was given these letters anonymously but found the contents so provocative that he sent them to friends in Boston. Despite Franklin’s instructions to the contrary, the letters were subsequently published. This led to Franklin being summoned to appear before the Privy Council, where he was accused of theft, deceit and breach of privacy by solicitor-general Alexander Wedderburn. When Franklin returned to America in the spring of 1775 he found the continent already at war with Britain. Almost immediately he was chosen as Pennsylvania’s delegate to the second Continental Congress. There Franklin became associated with outspoken pro-independence delegates, like John Adams; over the first months of 1776, Franklin began to accept and appreciate the arguments for an independent American nation. He supported the Continental Congress’ resolution to this effect and accepted a nomination for the five-man committee that was to draft a declaration of independence. S. Thompson & J. Llewellyn, “Benjamin Franklin”, Alpha History, accessed [today’s date], https://alphahistory.com/americanrevolution/benjamin-franklin/.